As much as being a forklift operator can be an interesting, fun and rewarding career choice, the unfortunate reality is that this job can be a serious industrial safety hazard, which is why proper training and certification is needed. Each year, there are an estimated 85 fatal accidents related to forklift operations, 34,900 serious accidents and 61,800 non-serious accidents. So the job of a forklift operator is something that should be taken very seriously. The operation of a forklift is not only a hazard to the operator but a hazard to those around it. 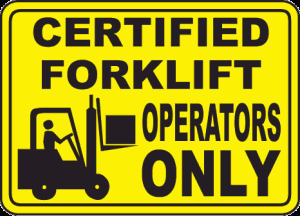 A forklift certification is an assurance that a forklift operator can do their job safely and efficiently. With this certification, the forklift operator’s employability and wage potential is increased by a greater percentage as compared to one who is not certified. A number of industrial operations require forklift operators to be certified by OSHA(Occupational Safety and Health Administration). The OSHA is part of the United State Department of Labor and its mission is to assure safe and healthful working conditions for working men and women by setting and enforcing standards and providing training, outreach, education and assistance. The eligibility of a forklift operator or a driver for other powered Industrial trucks such a heavy lifting vehicles and dumper trucks for that matter have to measure up to the rules that have been laid down by the OSHA. The OSHA doesn’t certify, accredit or approve trainers or training programs(classroom or online) with the exception of its 10- and 30-hour outreach programs. The OSHA is however in the business of compliance. Forklift operators wishing to learn how to get a Forklift certification will be glad to know that it doesn’t require long hours or as much expense to acquire the certification. A forklift operator needs to have good physical coordination, have the ability to follow written instructions and keep records. They also need to be able to complete physical tasks in an accurately fast manner and have the capability to judge measurements such as weights. May also be required to perform fill orders and check the accuracy of other order. A number of jobs that can be obtained with little or no advanced education typically come with lower salaries. Forklift drivers do fit this description, with the exception of those with forklift driving certifications. A forklift driver whose primary source of income is through the operation of the machinery can predict their salary from the average forklift driver salary. On the other hand, those who only do the forklifting job as part of a larger job can add onto their previous salary. With more experience and the possession of certifications however, the level of pay is much different from an ordinary forklift operator. Employees that work for an hourly pay in a company that allows overtime are eligible to an overtime pay. Those who work in a company that offers profit sharing and have access to the same can receive a share of the profit depending on how long they have been with the company and their position in the same. A number of forklift drivers are eligible to some type of performance or safety bonus, and a number of commercial and warehouse equipment do offer these incentives to encourage their driver work as productively as possible and abide by safety rules. Part time operators tend to receive a lesser pay than the average pay received by full-time workers. On the downside though, accidents are prone to happen around big machines, which is why safety is a major concern or forklift operators. According to the Fair Labor Standards Act, the forklift operators’ occupation is listed as hazardous, which is why being OSHA certified is a requirement for the safe and effective operation of the machinery. With this in mind, forklift safety training is essential for an all-round forklift operator. There will always be a need for forklift drivers for as long as businesses need to load or unload trucks and move goods around their warehouses. This being the case however, a trained forklift driver will be more employable and have more wage potential than an untrained one. As of April 2012, according to the official Government statistics, the average salary of a Forklift Driver in the United States is $35,000. This being a skilled occupation, forklift drivers need to be trained not only because they will be handling heavy machinery but because this can potentially be a hazardous occupation. Proper forklift driver training ensures that the health and safety of all the people at the factory or building site are safeguarded since the chances are much higher that the equipment will be handled with proper care. Companies and employers are permitted to appoint qualified employees to train and test their staff, for as long as the said employees are experienced with the machinery and know all the safety standards themselves. The requirements to becoming a certified forklift operator are neither expensive nor time consuming. An online training course covers a series of questions that the forklift driver needs to answer. The questions include legal requirements, rules regarding safety and personal questions about the driver. The online forklift certification course takes a few short hours to complete. In case the driver is currently employed, then their employer would need to evaluate their forklift driving ability and then proceed to issue a Forklift certification to the driver. The certification legally allows the forklift driver to operate for the next 3 years and can take up to a week for the paperwork to be processed and the ‘Forklift Driver Card’ to be issued. Following the lapse of the three year period, a re-evaluation and renewal of the certification is necessary to gauge the driver’s level of competence. For those who are not currently employed, a half-day or full-day forklift operator training course should be taken to ensure the driver is up to speed with the use of a standard forklift truck. The bare minimum required for a forklift operator is the possession of a high school diploma or GED certificate. A number of forklift operators do enroll in a forklift training school. A certification course in such a school can cover aspects such as proper forklift operation techniques, emergency prevention and response, loading and unloading practices, the principles of warehouse and inventory leadership and hazardous material transportation among others. Typically, employers look to hire forklift operators with 1-3 year of experience, however, entry-level opportunities are also available for those with certification and less than a year’s experience in the field. Legally, a forklift operator is not required to be licensed or certified, however, a number of employers prefer hiring those that are. When an unlicensed or uncertified operator is employed, typically, in-house certification courses are offered by the employers, however, these courses are supposed to comply with the OSHA certification standards. Whereas certification courses are relatively short-term, typically lasting no more than a day or two; workshops and seminars are essential because they are considered as the main source of training and education for the forklift operators. These workshops may be offered by safety organizations, employers or technical schools. Additional professional development information can be obtained from OSHA and forklift operation employers. Information can be obtained on current safety legislation, safety newsletters and resources for continued education. A number of training options are available and with them come varying costs in achieving the same. The exact cost of training will depend on where the training and testing is to take place. A look at the different options available will determine the exact cost of the same. Once the training is over and done with, operators may need to look into obtaining a forklift license. For looking for how to get forklift certification, the knowledge of the license is essential. This license requires the operator to sit an online test, which test covers the basic safety considerations that everyone should know when operating a forklift. The License is also essential in the validation of the driver’s knowledge and proficiency in forklifting. With it in hand, the operator becomes a certified forklift operator. Classroom training which generally includes training material in addition to written test or an acknowledgment of training. The OSHA permits each business to develop its own training program within certain set limitations. Site-specific training that includes situations that may affect the forklift operator such as the design and layout of the facility, how to handle hazardous material, and the need for hearing protection among others. Re-certification when the three year gap lapses for the previously issued certification. In addition to the expiry of the old certification, re-certification is also necessary when the operator has been involved in an accident or when they have been observed operating the machine in an unsafe manner. Forklift operator certification cannot be transferred from one employer to the next. A change in employers will mean a change in certification for the operator. This is because new concerns or requirements are present with the change in terms of the type of facility and machine to be used. A forklift license is legible to be renewed after 3 years of holding it. It is also legible to be renewed when there has been a switch in jobs or employers or when a new machinery has been incorporated into the workplace. In addition, when the operator has been involved in a forklift or powered industrial truck accident or been observe operating the machinery incorrectly, then the renewal is also necessary.